Bodzash Photography and Astronomy: Human Achievement Hour vs. Earth Hour: Need There be Conflict? Human Achievement Hour vs. Earth Hour: Need There be Conflict? 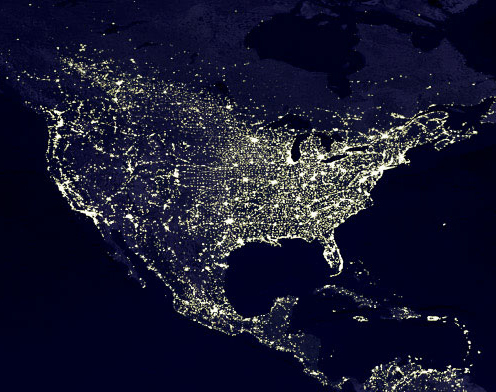 The Earth at night: the perfect symbol of our progress or our wastefulness depending on your opinion. Today, as many people all around the world know, brings Earth Hour, a worldwide event wherein people all over the globe are encouraged to reduce their energy usage for the purpose of saving natural resources and, in general, the planet. However, there is another worldwide even going on at the same time, as a direct challenge to Earth Hour. This is Human Achievement Hour. Needless to say, the whole idea of Human Achievement Hour goes contrary to Earth Hour, which serves as a rallying point to encourage governments to adopt policies that are more environmentally-friendly and lean in the direction of saving natural resources, while Human Achievement Hour champions the technology that those celebrating Earth Hour have vowed to spurn for 60 minutes. So, come this evening's newscasts, it will be interesting to see how the mainstream media approaches coverage of these pair of hour long celebrations, ones that, when viewed in the extreme, are sure to cause some elevated blood pressure levels in the people who champion the opposite cause. Personally, I had never even heard of Human Achievement Hour before yesterday and seeing a story about it on the Internet. Earth Hour? Well, it's gone from a regional event to a worldwide phenomenon. In the end, the middle path is the best course to take. There is no doubt that we humans are using up our natural resources at an ever-increasing rate. Global warming? Well, several of the hottest years on record have come during the past decade but, at the same time, the planet has been an ice ball, a greenhouse, and everything in between during its 4.5 billion year history. At the same time, though, there is no conclusive way to prove that we humans are impacting the climate, only correlations. On the other hand, there is no doubt that technology has greatly enlarged man's footprint on the natural world. On the other side of the coin, there is no doubt that science, technology, and the focus on the individual are making the world better every day. Think of it: if it were not for science and the inventive spirit that Human achievement Hour seeks to celebrate, we would still be in the Dark Ages. Think of it: there would be no real medical knowledge, no mechanical means of transportation, no mass dissemination of knowledge, no electricity, no space exploration, no computers, no Bodzash Photography and Astronomy, but a lot of mass superstition, ignorance, death and disease, starvation, and millions upon millions of fettered minds without the slightest aspiration to achieve higher goals than an animal-like existence of living from one day to the next. Yes, the world is undoubtedly walking a tightrope when it comes to planet Earth, this pale blue dot that is, so far as we know, the only world in all of creation that supports life. Man has become God, having created for himself the power to preserve or destroy worlds by way of his technology. The choice is before us: life or death. Hopefully, we will choose life through wise use of our technology which, for the most part, has improved the world in incalculable ways ever since our distant ancestors first strove to make a better life for themselves all those tens of thousands of years ago.